Oh, was I annoyed when I went to the fridge tonight! It seemed like every last thing I had went moldy! My hokkien noodles were moldy, my tofu puffs were moldy, my kamaboko fishcake was moldy, and my bamboo shoots were moldy!!! Grrrrrrrr!!! I think I should freeze things more often and maybe I could prevent this from happening. So what I thought I was going to make didn't happen, but I think I did a pretty good job of creating something with what I had left. I used what's called "flour slice" for the noodles tonight. Basically, they're large, thin, flat noodles made from only two ingredients: wheat flour and water (and since they're dried, probably just wheat flour). Where do you get them? Well, I'm actually not sure. The only reason I have them is because one of my suitemates left them after moving out at the end of the year last year, so I took them. I suppose you could use any noodle you have lying around--udon noodles are wheat flour noodles, so that might taste similar, anyway. Slice the char sui and konnyaku into 1/8 in. slices. Heat a little oil in a pan and add the pork and yam cake. 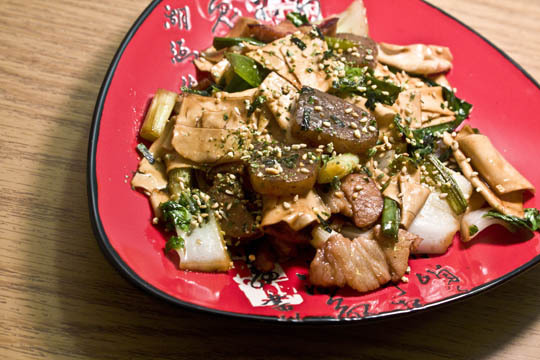 Stir-fry 1-2 minutes until the pork has browned and the konnyaku heats through. Cut the spring onions into 1 in. pieces and the bok choy into 1 in. square pieces. Add both vegetables to the pan and stir-fry 1-2 minutes, or until the vegetables have softened and cooked. Mix the soy sauce, rice wine, and water. Add the sauce to the pan, then add the flour slice noodles. Continue to cook and boil for 3-4 minutes, or until the noodles have softened well. Sprinkle with yasai fumi furikake and serve. 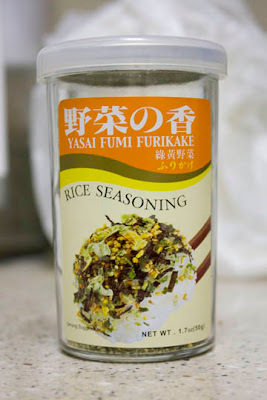 Note: What is yasai fumi furikake?? Some of you have been asking me about it. Yasai fumi furikake is a rice seasoning that consists of dried vegetables such as spinach, mustard greens, sesame seeds, and nori seaweed, as well as dried granules of egg yolk. It sounds a little odd, but it's quite delicious and looks pretty when sprinkled on food. It's really an optional thing in my recipes because I just use it as a little garnishing thing, so you don't need it if you can't find it, but it really does add a nice flavoring.